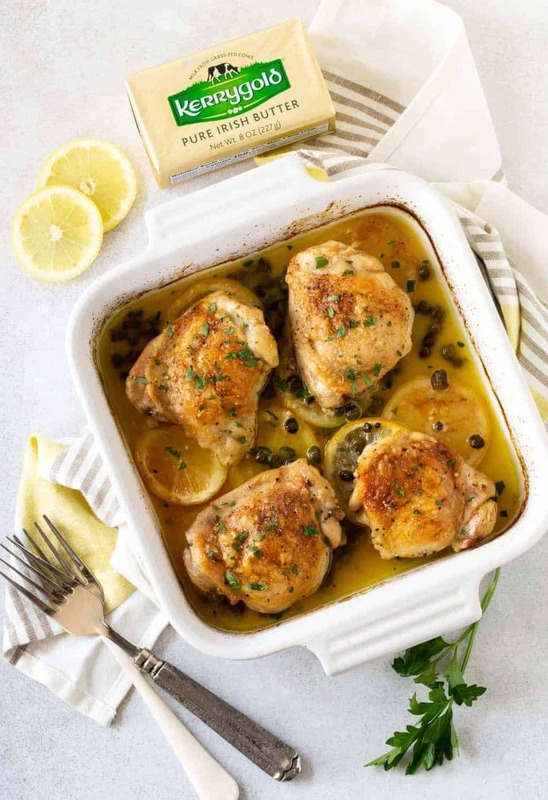 Packed with flavor, these Crispy Baked Chicken Thighs with Capers use just a handful of ingredients and are ready in less than an hour. 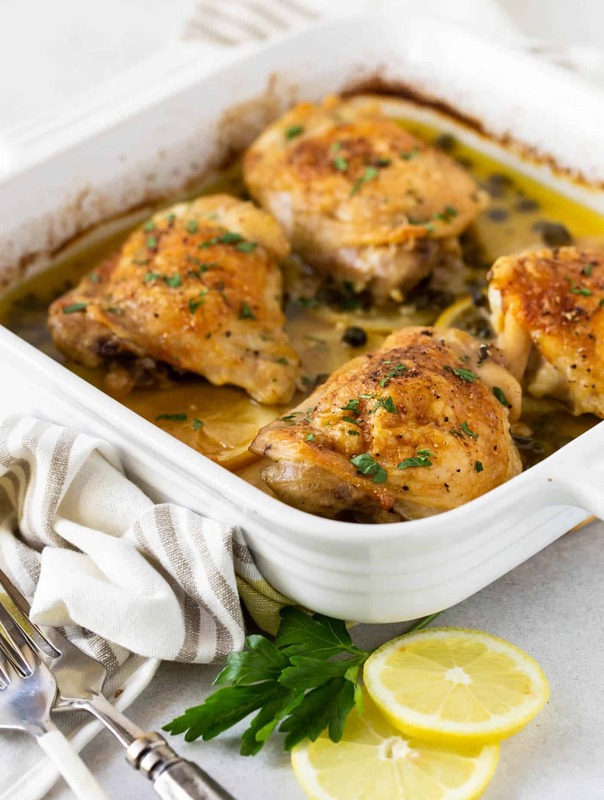 Get all of the flavors of chicken picatta combined with crispy skin in this easy one-pan chicken recipe! Chicken thighs don’t get the love they deserve, but they are the star of the show in this Crispy Baked Chicken Thighs with Capers recipe. I know what you’re thinking; you can’t get crispy skin in the oven. Trust me. You can. How does the chicken get crispy without frying? That’s easy. Butter. Specifically Kerrygold® Butter. The key to getting the skin crispy is melted butter. Don’t pour the other liquid ingredients over the chicken. Make sure that the only thing besides salt and pepper that hits the skin is the butter and you will be rewarded with crispy skin without the mess. Who knew it was that easy? How does the chicken get its lemon flavor? Simply slice a lemon and place the wheels in the bottom of the pan. Set the thighs on top of them and the lemon flavor bakes right into the chicken, no juicing required. 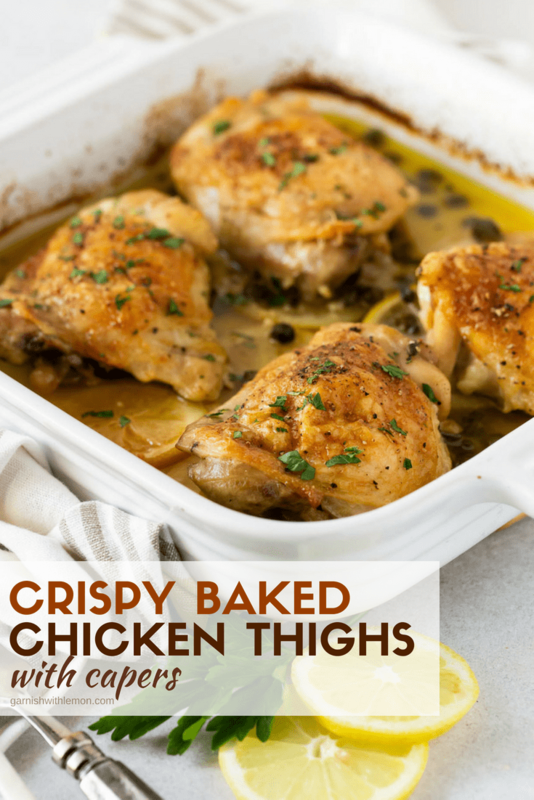 Do I have to use chicken thighs for this recipe? You don’t have to, but I recommend it as the flavor is second to none (and this is coming from a white-meat loving gal.) You can substitute a chicken breast, too, but just make sure you leave the skin on for the golden brown color and adjust your cooking time accordingly. Add an easy arugula salad , some green beans, and boom! Dinner is done. This dish has just moved into our regular dinner rotation and soon it will be in yours, too. Coincidence? I think not. You know a good thing when you see it. Spray the bottom of a 9 x 9 square pan with cooking spray and place the lemon slices in it. Add the capers, garlic and white wine to the bottom of the baking dish. Place the chicken thighs on top, skin side up in it. Brush the tops of the chicken thighs with melted butter, reserving 1 tablespoon for basting. Bake for 20 minutes and baste the top of chicken with remaining 1 tablespoon of melted butter. Bake for an additional 20 minutes or until thermometer reads 165. Serve the chicken with rice if desired and spoon sauce over both.